Leave a comment below telling us what you got out of Mobile Nations Fitness Month and be entered for a chance to win the phone, tablet, or game system of your dreams! That's right, it's time to bring everything together and work towards a balanced life! It's really hard to eat and sleep well, and exercise regularly, especially with as all the other things we have to do. That's why it's important to not only act healthier for a week or month, but to build healthier habits into your ever day lifestyle. To round out the month, we'll be reviewing a bunch of great apps and accessories that can help you keep it together, and keep yourself on track with your nutrition, exercise and relaxation goals. And we are also going to be doing the mother of all contests. Contest: Win the fitness device of your dreams! Leave a comment below telling us what you've gotten out of Mobile Nations Fitness Month -- how much you've improved or been inspired, what you plan to do to keep it up throughout the year, or even how much you simply sat on the couch and watched it all transpire around you! -- and you'll be entered to win a $400 gift certificate to put towards whatever phone, tablet, or even gaming system will help you keep up with your fitness goals! Be it iPhone or Galaxy Note, Lumia or BlackBerry, Surface or Droid, iPad or Android tablet, Xbox or Wii, we want to help you bring it home! So what are you waiting for? Enter NOW, NOW, NOW! Following up on the surprise news this morning that LG is buying HP's webOS division, we were left with questions. How? Why? When? We spoke with HP SVP of webOS Martin Risau and LG North America VP of Smart TV Sam Chang about why LG purchased webOS, what they're planning on doing with it, and what exactly HP is doing here as well. As we reported back in October (much to the chagrin of HP and LG), the two companies were working together for several months to produce a webOS-powered smart TV for LG. Chang said that "during this time we [LG] were very impressed with the technology, but also the people behind it. That's what really drove this transaction." The 'people behind it' are indeed an important part of webOS, and adding them to LG's roster brings a lot of talent and experience with webOS. While accessing Just Type to perform a search on your TouchPad is never more than a swipe and a tap away (by swiping up to minimize the current app and then tapping on the "Just type..." search bar), LunaCE--the homebrew update for the TouchPad by WebOS Ports based off the Open Source "webOS Community Edition" (not to be confused with Open webOS)--makes it even easier. 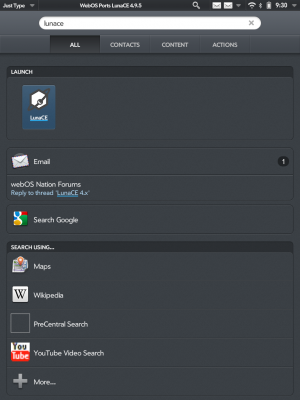 LunaCE gives you the ability to add a persistent icon to the status bar on the top of the TouchPad's screen that will give you quick-access to the Just Type search screen from almost anywhere in webOS. If you can see the icon on the top-right of the screen, you can access Just Type and won't even need to leave your current app first. Note that LunaCE is currently in beta so you will need to go through the process to set-up the beta feeds in Preware, which can be found at testing.preware.org. In addition, you will need to have Tweaks installed on your TouchPad to toggle this new feature. Once you have both of them installed, you just need to go to the "Luna" section of Tweaks and toggle "Enable Search Icon" to YES in the "STATUS BAR" section to activate this feature. Moreso than HP abandoning webOS for Android, this purchase of all webOS assets by LG represents a significant turning point for this webOS community. Palm and webOS have changed hands so many times it's boggling to think about - in just the past four years, Palm saw a major cash infusion from Elevation Partners, launched a new mobile platform, got bought by HP, launched their first tablet, saw that tablet get brutally canceled, was split in two, shopped around, open sourced, and now sold to Korean electronics giant LG. How do you feel about LG buying webOS from HP? Win a FREE iPad mini in your choice of AnoStyle color! Nokia Music+ goes live in the U.S. Market, let the unlimited downloads begin! The 'Spring into TEGRA' Contest: Win a Tegra-powered Windows 8 RT Tablet! According to a report this morning from CNET that has since been pulled (though we have independently verified) LG is purchasing the webOS Global Business Unit from HP, including all of its patents, employees, and source code. This news follows our exclusive report in October that LG was working with HP to develop a webOS-powered smart TV. Our sources tell us that LG now anticipates launching their first webOS-powered HDTV at CES 2014. Palm, and by extension webOS, was purchased by HP just under three years ago for $1.2 billion, invested billions in launching new hardware and expanding the reach of webOS to PCs, and then abruptly cancelled hardware development before ultimately opting to open source the operating system. Those joining LG will be positioned under the office of LG CTO President and CEO Skott Ahn and not as part of the television group. The arrangement might be similar to that the webOS GBU was put under in 2010, when they were slotted under HP's Office of Strategy and Technology incubator while the decision of what exactly to do with the OS was being made. The end goal of LG buying webOS like this is the same as their partnership from last year: to make a webOS-powered television to replace LG's aging NetCast smart TV platform. We and CNET have seen no indication that LG intends to use webOS to supplement their Android smartphone business, though with LG coming in at fifth place in the global smartphone share rankings with less than five percent market share, nothing's impossible. LG at the very least has the experience and manpower in mobile they would need to bring webOS up to modern standards. That said, as much as we would love to see webOS for mobile from LG, we doubt that's going to happen. With LG snapping up the majority of HP's webOS programming talent and dedicating it to their smart television endeavours, we would be shocked to see webOS hit LG's other endeavours. Even in fifth place, LG's managed to sell more Android smartphones and than HP did webOS devices. Though, there might be some hope for other webos-powered LG products, as CNET quotes Ahn as saying "It creates a new path for LG to offer an intuitive user experience and Internet services across a range of consumer electronics devices." Read into that what you will, but don't put too much of your money on LG webOS smartphones and tablets. 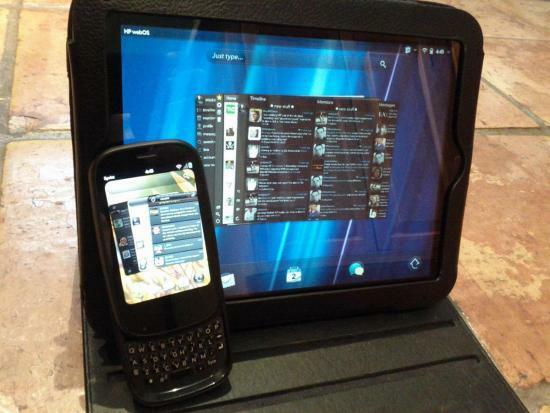 We also would be surprised to see webOS as we know it come from anybody else to mobile. While HP might technically still own the operating system and the code has been fully committed to open source, without the resources of the webOS GBU to assist third parties in the development of webOS hardware (as they did with LG) it's just not all that likely a third party is going to produce webOS hardware. Granted, it wasn't all that likely before, now it's just less so. We still hope that the soon-to-be-LG employees of the webOS GBU will still be assisting the WebOS Ports team in their own efforts to bring Open webOS to more hardware. Those of you with webOS devices, though, CNET says that LG will continue with HP's support commitments, though we have to wonder how long that will last - it's been 18 months since the last webOS device sales, and there's HP's homebrew connections to look after as well. We have reached out to both LG and HP and are awaiting comment.